When we were in China, Katja and I took our kids (the ones that were in China!) to a shopping center with the intention of looking at silk. Now, I never buy silk here in the States so finding out they originally wanted something like $100/meter nearly knocked me over. In the end, after stressful haggling, I got two meters of black silk to make Noah a shirt for about <$20/meter. 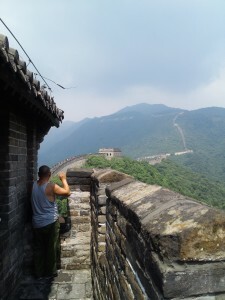 Still a lot for me to spend, but when will I be in Beijing again? When we got home I found an old Butterick costume pattern on Etsy that had a Mandarin shirt like I wanted to make for him. I spent all of $7.80 with shipping for it. A day or so after I placed my order I got a note from the seller telling me that she was away from home for her mother's funeral and it might be a few days before she could ship the pattern. I wrote her immediately back and said not to rush and to take care of herself first. I buried my mom 4 years ago and still remember the fog I was in most of that year. 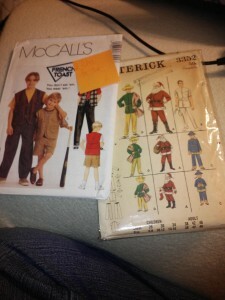 Today I got a package from her with not only the pattern I ordered but another one Noah's size with for a shirt, pants and lined vest like he would wear fishing or camping! Now she didn’t have to do that! And I certainly didn’t sympathize with her and exercise patience to get something. I never expected anything like this. Maybe there is something to this Karma thing or maybe virtue truly is its own reward. P.S. if you are looking for vintage sewing patterns, check out SewBohemian on Etsy! !